All the above are widely used in East Asia, south America, Caribbean and Africa. These root vegetables mainly full vitamin B12. • 2 vegetable stock cube. 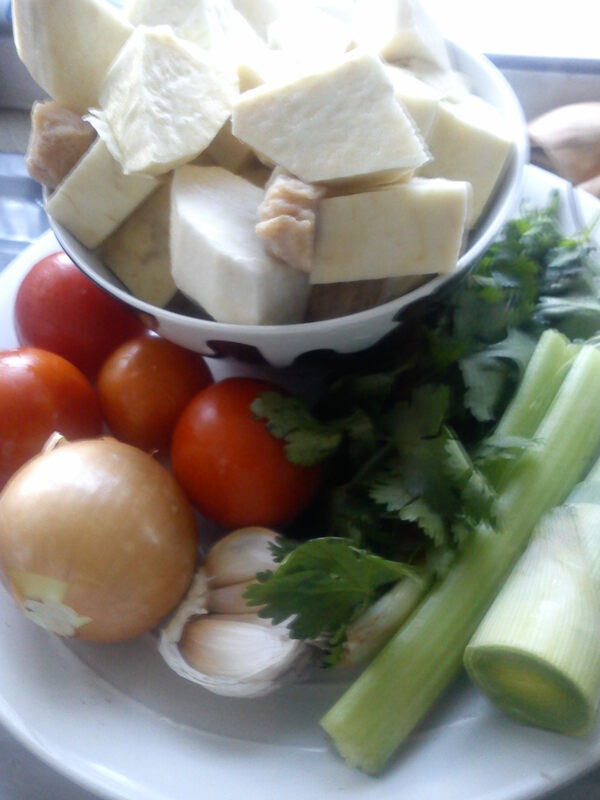 *Start by rinsing, preparing and blending the following: half the onion, leek, parsley, garlic and all the tomato. Set aside. *Boil 200ml of salted water and pour over the dried soya meat balls to rehydrate. Leave it for 15 minutes and squeeze out the water. Set aside. *Peel the yam, coco, and sweet potato, rinse and set aside in a container covering the content with water from the tap. Covering them with fresh water will prevent them from darkening in the same way the avocado or aubergine does. *Melt the two stock cubes in 700 ml of boiling water. Set aside. In a deep pan, heat 3 table spoons of palm oil and add finely chopped red onion with the thyme. Once the onion is browned, add the soya meatballs and brown for 5 minutes so they can absorb the onion and thyme. Now add in the blended ingredients, stir and cover the pot for about 10 minutes, then stir again and the liquid from the ingredient dries. Add salt and black pepper. Now drain and add the root vegetables and the whole chilli pepper. Mix well and pour in the 700ml of stock. Cover the pot and let it simmer for 40 minutes, checking that the water doesn’t run out completely. The hardest to cook amongst the 3 roots vegetables is the coco. So, when the yam and the sweet potatoes are starting to loosen up and the starch is making up part of the soup, check that the coco is well cooked and falling parts. If it is the case, then your stew is ready. Taste and adjust the seasoning. Dish this might be hot… better serve it with a glass of very cold water… lol. Better have this for lunch and not dinner as it quite calorific. This dish is so full of goodness. The colour will mainly come from the palm oil which contains vitamin B6, Carotene and Q10. All three of the roots used here contain folic acid, vitamin B and C. They are a worthy replacement for the humble potato along with cassava. I highly recommend the use of these vegetables if you suffer from anaemia as I do. This entry was posted in Main meals and tagged Garlic, leek, Onion, soya chunks, sweet potatoe, tomatoes, vegan, yam. Bookmark the permalink. Food nutter, have you change your format of your blog. Your first picture caught my attention as it looks so familiar and this stew is totally new to me! Will try one day. Manage to find the lotus roots? Cheers and have a nice day! Hi Ken, I haven’t… Just showing off, what exotic root veges look like…I may have circulate this picture before… do you know these? as for the lotus root, China town is a bit far away from me, but I’ll definitely try to cook them.